So, last time we spoke about two ways by which cities around the world are coping with climate change: slum relocation and waste management – with different degrees of success. 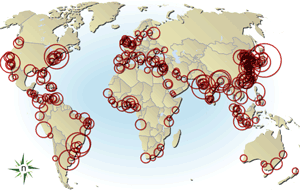 Today, let’s discuss a big one: sea level rise. The sea has been rising faster in the last 25 years than it has in the last 300 years – by about 1.5 inches a decade. Is it a huge number – other than small island nations (like Maldives) and people who own expensive real estate – no one has been really bothered by this. But consider the future. 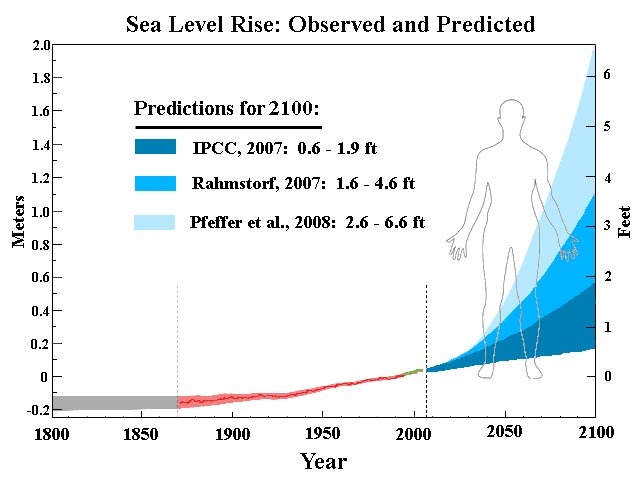 The figure below shows that the sea could very well rise by 2-3 feet in the next 80 or so years and then the world becomes a very different place. http://www.wunderground.com/blog/JeffMasters/comment.html?entrynum=1255; Link from Most experts think the projections of Rahmstorf are more likely. See http://www.nature.com/climate/2010/1004/pdf/climate.2010.29.pdf for an update on Rahmstorf’s projections. Combine this understanding with the fact that most cities are located by the coast. Cities themselves exacerbate the risks they face. They encroach on flood reservoirs (the slum factor mentioned in the last post); they over exploit their ground water (this causes the land to sink); they build too close to the sea – not giving the beach space to grow or adapt and they destroy mangroves that tend to protect the coastline. The World Bank study goes on the say that the potential annual losses by 2050 could be cut from $1 trillion to about $ 65 billion IF the cities spent about $50 billion in adaptation measures. Once you note that many of the circles are in developing countries, you begin to see that this is not an easy proposition. Another interesting point in the map above shows that many of the dots are in China – perhaps a reason why China has been quite the model country in talking about mitigating climate change causes.